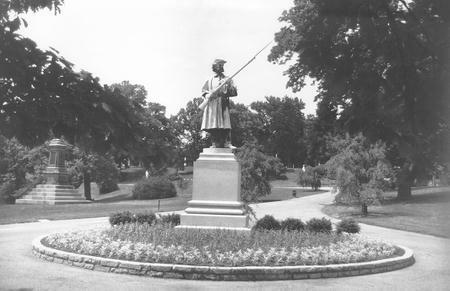 A Union Army Sentinel stands in uniform holding a rifle with the bayonet in the air. His head is turned to the proper left. An article in "Harper’s New Monthly" magazine from June of 1866 includes a detail on the inspiration for the figure. An Englishwoman stated to the sculptor, Randolph Rogers, that she supposed the man was Stonewall Jackson, a prominent Confederate general, to which Rogers replied that it was, contrarily, the man who had shot him. This sculpture acted as the model for later versions to be mass-produced all across the United States for both Confederate and Union soldier monuments. There were two companies who used this general design most predominantly in the Eastern part of the country: The Monumental Bronze Company of Bridgeport, CT, and W.H. Mullins Company of Salem, OH. : Randolph Rogers, “The Sentinel,” Ohio Outdoor Sculpture Inventory, accessed April 20, 2019, http://oosi.sculpturecenter.org/items/show/579.